Figure A. Alexa Fluor 647 conjugated Mouse anti Human CD14 (MCA1568A647) and Alexa Fluor 488 conjugated Mouse IgG1 isotype control (MCA928A488). Figure B. Alexa Fluor 647 conjugated Mouse anti Human CD14 (MCA1568A647) and Alexa Fluor 488 conjugated Mouse anti Human CD16 (MCA2537A488). All experiments performed on red cell lysed human blood gated on mononuclear cells in the presence of 10% human serum. Data acquired on the ZE5™ Cell Analyzer. Figure A. RPE-Alexa Fluor 750 conjugated Mouse anti Human CD14 (MCA1568P750) and Alexa Fluor 700 conjugated Mouse IgG1 isotype control (MCA928A700). Figure B. RPE-Alexa Fluor 750 conjugated Mouse anti human CD14 (MCA1568P750) and Alexa Fluor 700 conjugated mouse anti human CD16 (MCA2537A700). All experiments performed on red cell lysed human blood gated on mononuclear cells in the presence of 10% human serum. Data acquired on the ZE5™ Cell Analyzer. Mouse anti Human CD16 antibody, clone DJ130c (MCA2537) used for the detection of CD16 on in vitro polarized human macrophages by flow cytometry. Expression of phenotypic markers on in vitro polarized human macrophages. Healthy peripheral blood monocytes were cultured for 4 days in medium or in medium supplemented with IFN-γ, IL-4, IL-10, or LPS in the absence (white bars) or presence (black bars) of HAGGs. Expression of MØIFN-γ markers CD80 and CD64, MØIL-4 markers CD200R and CD14, and MØIL-10 markers CD163, CD16 and CD32 was measured by flow cytometry. Bars represent the mean ± SEM of 4 independent experiments. *p<0.05, **p<0.01, #p<0.01. 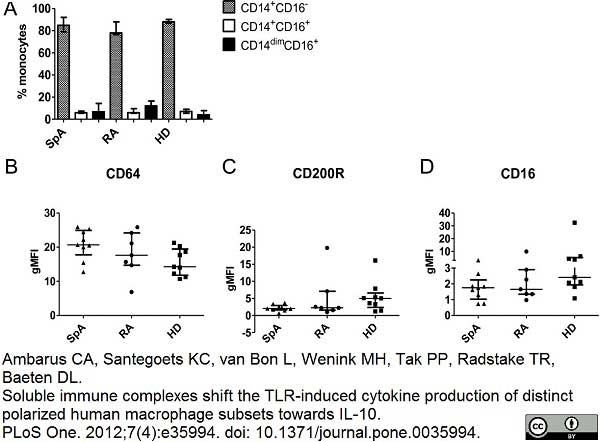 Soluble Immune Complexes Shift the TLR-Induced Cytokine Production of Distinct Polarized Human Macrophage Subsets towards IL-10. 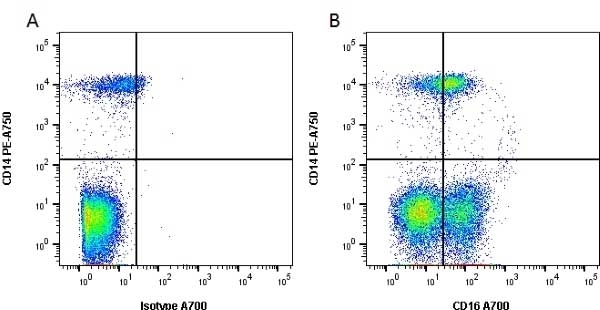 Characterization of human monocyte subsets using Mouse anti Human CD16 antibody, clone DJ130c (MCA2537) by flow cytometry. Monocyte subsets and expression of phenotypic markers on spondyloarthritis (SpA) and rheumatoid arthritis (RA) patients and healthy donor monocytes. The percentage of CD14+CD16-, CD14+CD16+, and CD14dimCD16+ monocytes from SpA and RA patients and healthy donors was measured with flow cytometry (A). 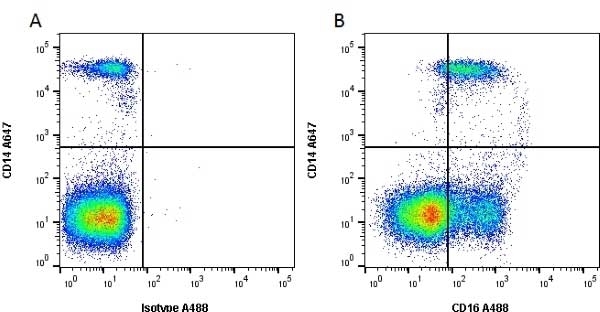 Expression of CD64, CD200R, and CD16 on monocytes from SpA and RA patients and healthy donors was measured with flow cytometry and expressed as geometric mean fluorescence intensity (gMFI). Data are represented as median and interquartile range of at least seven independent experiments (B). From: Ambarus CA, Noordenbos T, de Hair MJ, Tak PP, Baeten DL. Intimal lining layer macrophages but not synovial sublining macrophages display an IL-10 polarized-like phenotype in chronic synovitis. Arthritis Res Ther. 2012 Apr 11;14(2):R74. Published customer image:Mouse anti Human CD16 antibody, clone DJ130c (MCA2537) used for the evaluation of CD16 expression on macrophages by flow cytometry. Characterization of CD16 expression on in vitro polarized macrophages by flow cytometry using Mouse anti Human CD16 antibody, clone DJ130c. Expression of phenotypic markers on in vitro polarized monocyte-derived macrophages from spondyloarthritis (SpA) and rheumatoid arthritis (RA) patients and healthy individuals. The expression of MΦIFN-γ markers CD80 and CD64, MØIL-4 markers CD200R and CD14, and MøIL-10 markers CD163 and CD16 was measured with flow cytometry on in vitro polarized monocyte-derived macrophages. Data are expressed as geometric mean fluorescence intensity (gMFI) of the marker expression after polarization with IFN-γ, IL-4, or IL-10, respectively, divided by the gMFI of the marker expression on unpolarized macrophages. Data are represented as median and interquartile range of at least five independent experiments. From: Ambarus CA, Noordenbos T, de Hair MJ, Tak PP, Baeten DL. Intimal lining layer macrophages but not synovial sublining macrophages display an IL-10 polarized-like phenotype in chronic synovitis. Arthritis Res Ther. 2012 Apr 11;14(2):R74. Figure A. FITC conjugated Mouse anti Human CD14 (MCA1568F) and Pacific Blue conjugated Mouse IgG1 isotype control (MCA928PB). Figure B. FITC conjugated Mouse anti Human CD14 (MCA1568F) and Pacific Blue conjugated Mouse anti Human CD54 (MCA2437PB). All experiments performed on human blood gated on live single mononuclear cells, in the presence of 10% human serum. Data acquired on the ZE5 Cell Analyzer. Mouse anti Human CD16 antibody, clone DJ130c recognizes human CD16, also known as Low affinity immunoglobulin gamma Fc region receptor III-A or Fc-gamma RIIIa. CD16a is a 254 amino acid ~50-65 kDa single pass type 1 transmembrane glycoprotein bearing two Ig-like C2 type domains. CD16 exists as a transmembranous form (Fc gammaRIIIA, or CD16A) and a glycosyl phosphatidylinositol (GPI) anchored form, Fc gammaRIIIB, or CD16B (Scallon et al. 1989). CD16A is expressed by NK cells, some T cells, and macrophages, whereas CD16B is primarily expressed by granulocytes (Ravetch and Perussia 1989). In addition, CD16B exists as two allelic variants NA1 and NA2 . DJ130c recognizes all polymorphonuclear cells irrespective of their NA phenotype. Schmidt, R.E. (1993) CD16 cluster workshop report. In Leucocyte Typing V: White cell differentiation antigens, Vol.1. Edited by Schlossman, S.F. et al. Oxford University Press. p805 – 806. Shantsila, E. et al. (2012) Fibrinolytic status in acute coronary syndromes: evidence of differences in relation to clinical features and pathophysiological pathways. Shantsila, E. et al. (2011) Immunophenotypic characterization of human monocyte subsets: possible implications for cardiovascular disease pathophysiology. J Thromb Haemost. 9: 1056-66. Tapp, L.D. et al. (2012) The CD14++CD16+ monocyte subset and monocyte-platelet interactions in patients with ST-elevation myocardial infarction. J Thromb Haemost. 10: 1231-41. Ambarus, C.A. et al. 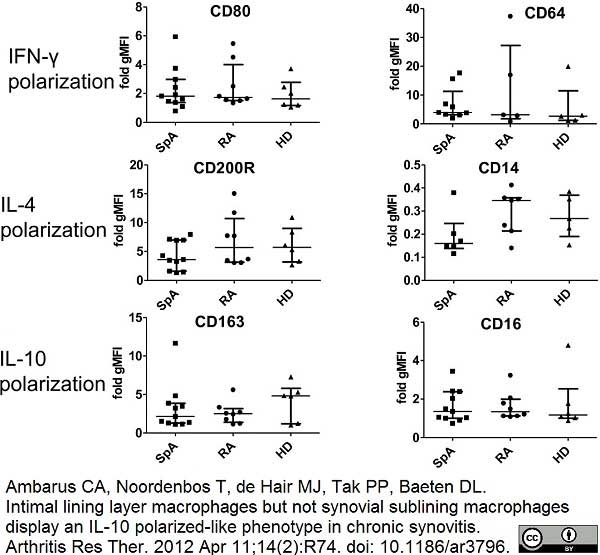 (2012) Intimal lining layer macrophages but not synovial sublining macrophages display an IL-10 polarized-like phenotype in chronic synovitis. Arthritis Res Ther. 14: R74. Ambarus, C.A. et al. (2012) Systematic validation of specific phenotypic markers for in vitro polarized human macrophages. J Immunol Methods. 375: 196-206. Ambarus, C.A. et al. 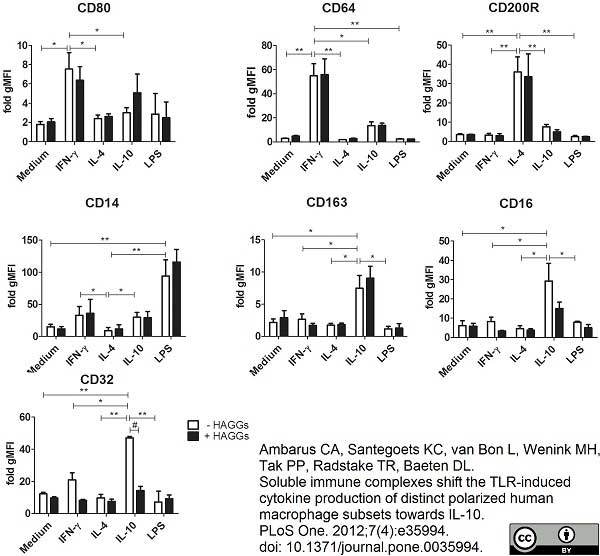 (2012) Soluble immune complexes shift the TLR-induced cytokine production of distinct polarized human macrophage subsets towards IL-10. Shantsila, E. et al. (2012) The effects of exercise and diurnal variation on monocyte subsets and monocyte-platelet aggregates. Eur J Clin Invest. 42: 832-9. Chehadeh. W. et al. (2009) Antibody-mediated opsonization of red blood cells in parvovirus B19 infection. Wrigley, B.J. et al. (2013) Increased formation of monocyte-platelet aggregates in ischemic heart failure. Circ Heart Fail. 6: 127-35. Jaipersad, A.S. et al. (2014) Expression of monocyte subsets and angiogenic markers in relation to carotid plaque neovascularization in patients with pre-existing coronary artery disease and carotid stenosis. Shantsila, E. et al. (2015) Free Light Chains in patients with acute coronary syndromes: Relationships to inflammation and renal function. Int J Cardiol. 185: 322-7. Circ Heart Fail. 6 (1): 127-35. Romee R et al. (2013) NK cell CD16 surface expression and function is regulated by a disintegrin and metalloprotease-17 (ADAM17). Sousa, S. et al. (2015) Human breast cancer cells educate macrophages toward the M2 activation status. Breast Cancer Res. 17: 101. Shantsila, E. et al. (2019) Mon2 predicts poor outcome in ST-elevation myocardial infarction. J Intern Med. 285 (3): 301-16.